You are here: Home / Jorja Fox / Extinction Soup Wins at BIFFLA! Extinction Soup Wins at BIFFLA! Last night I made it up to LA with my friend, Stephanie, to watch the LA premiere of Extinction Soup at the Broadway International Film Festival in LA, where it won Best Documentary. The movie was not what I expected. Yes, it was definitely about how horrible people are with complete disregard for animals, but it was much, much more than that. The movie starts out asking us if we’re afraid of sharks, and that most people are, without having ever seen one in the wild. The first part of the movie is about Phillip Waller’s personal journey from acting to depression to recovery via surfing. He was drawn into sharks by a friend, and the passion led to him wanting to learn about why sharks were important. Clearly sharks didn’t want to just eat people. From there, and the death of his friend, spurred Waller into learning more about how sharks are vital to the health of the ocean. They balance the ecosystem, keeping the oceans healthy. Which brings us to the brunt of the movie. Shark fear, perpetuated by news and movies, is not the actual danger to them. The real danger to sharks is soup. To make shark fin soup, generally the shark is caught, it’s fun cut off, and the shark is thrown back in the ocean to die. 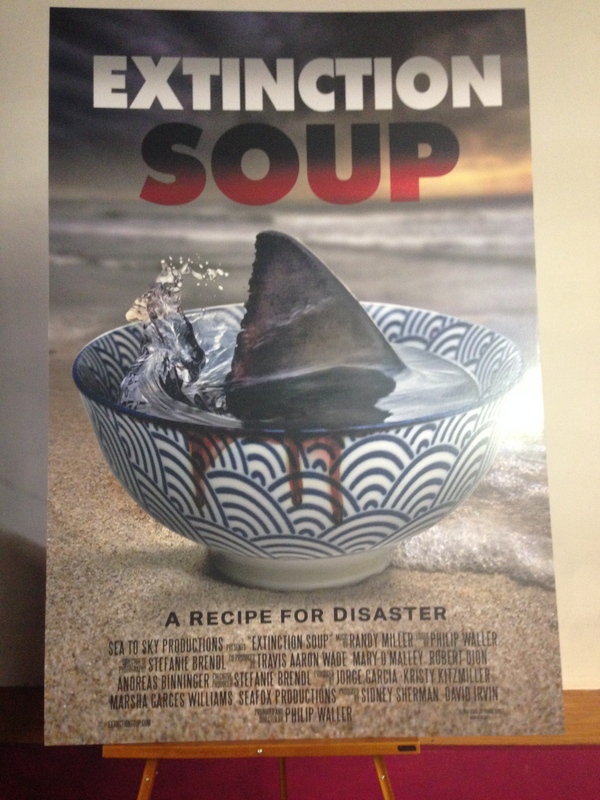 In the time it took to watch the movie, 10,000 sharks were killed to make soup. But there is good news! Hawaii, California, and other states are making it illegal to have any part of a shark. No fins, no meat, no soup. And more and more countries are banning it. I was able to meet and talk to both Phillip Waller and Stefanie Brendel, both of whom were very lovely and polite and excited to share their passion with the ocean and with sharks with us. Is the movie sad? Yes. Is it worthwhile? Yes. The more we know about these things, the more we can stop it, and the more we can protect the oceans. Here’s a video of the award and acceptance. The loud ‘Wooo!’ at the beginning is me. Video’s from Stephanie, I’m a terrible photographer/video person. I prefer to enjoy the moment.